Shopback: Save On Online Shopping With Cashback And More! Readers of heartlandboy.com would know that Heartland Boy continuously finds ways to reduce the cost of his weekly flights from Jakarta to Singapore. For instance, he books his air tickets using the ANZ Optimum Credit Card to enjoy 5% cashback. He also takes Uber instead of regular taxis. He thought that was the furthest he could stretch his dollar, until he was invited to try Shopback. He immediately took a liking to Shopback and began to save on online shopping with cashback. So here is his review on Shopback. Shopback was founded by a group of friends who all had relevant experience in the e-commerce industry. While the entrepreneurial fire in Heartland Boy may have dimmed with each passing day in the corporate world, he would very much still like to support entrepreneurs who have the courage to take the plunge. Shopback is a online shopping cashback website that allows members to shop online and earn cashback with each purchase. Members also enjoy fantastic discount coupon deals at their favourite online shops. All you have to do is to follow the simple and well-explained instructions on every participating merchant’s page to earn your cashback! Your cashback would start accumulating with each purchase you make with Shopback’s merchant. When your account reaches over $10, you can transfer the credit into your own bank account. So the cashback you earn at Shopback is as good as cash in your bank! Here is a video of how Shopback works. As the world becomes more digitalized, our consumption experiences are increasingly occurring online. For instance, time-pressed professionals save time and money by buying groceries online with a Fairprice Online promotion, and also Honestbee etc. Even Heartland Boy reserves his Cathay Cineplexes movie tickets online as he does not want to incur the wrath of Heartland Girl. Therefore, the amazing thing about Shopback is that it brings all online shopping experiences into one site. In fact, it has so drastically changed the online shopping behavior of Heartland Boy such that he now first checks if the merchant is a participant of Shopback before making an online purchase. It has become the go-to site that Heartland Boy uses for online shopping with cashback. Getting all the merchants under one place is what makes Shopback’s cash back progrmme so convenient and alluring. Heartland Boy read that one of the founders, Samantha Soh, honed her website design skills as a lead designer of Zalora. Her experiences there probably helped shaped Shopback into one of the most user-friendly “online shopping with cashback” websites. You can tell that the website was developed from the user perspective. Various merchants are laid out into the various categories and this help to save time if the online shoppers want to look for only a certain consumer product class. Your account is also stated right at the top which is simple to read and access. Since it is at the landing page, it stares right at you every time you log into the website. This serves as a great motivation tool for you to build your Shopback account. Finally, and perhaps the most important reason why Heartland Boy likes Shopback so much is that it has helped the Heartland Couple saved on online shopping with cashback. As Heartland Boy had mentioned earlier, he now books his weekly Jakarta flights via Shopback. And it is amazing that Shopback has managed to get AirAsia, JetStar and Tiger all on board. These are all airlines that ply the Singapore-Jakarta route on a daily basis. The awesome thing is that it doesn’t end there. 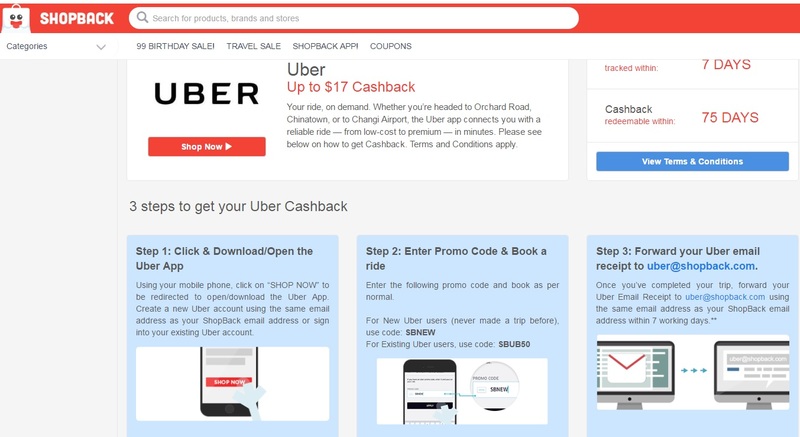 Once Heartland Boy gets off at the airport, he hops onto an Uber Car that was booked with an Uber promo code via Shopback. That saves him $0.30 per trip and easily adds up to $2.40 per month. All he has to do is to send the electronic invoice to Shopback after every trip and then watch the money grow in his Shopback account. This makes Shopback one of the cashback website in Singapore that offers the best discount and savings. Actually, Heartland Girl is quite smart too lah. She will jump onto the bandwagon when she smells a good deal too. The ever knowledge-hungry Heartland Girl has been buying her books from The Book Depository via Shopback too! to earn an instant $5 cashback. Using Heartland Boy’s referral code, you also get to enjoy another $5 when you make your first purchase! That is a free $10! So hurry and quickly follow in Heartland Girl’s footsteps to shop online and earn cashback on your purchases! Here are related articles indicating Heartland Boy’s experience as a satisfied customer of Shopback! i recently started using SB too. its quite good. i have already redeemed about $20+. btw, there is a way to get that $5 easily.. get your wife to sign up with your referral and buy using her account. Thanks for dropping by my website! That’s a great tip! Thanks for sharing.